Our 100th Annual Memorial Service was held on Sunday May 27, 2018! 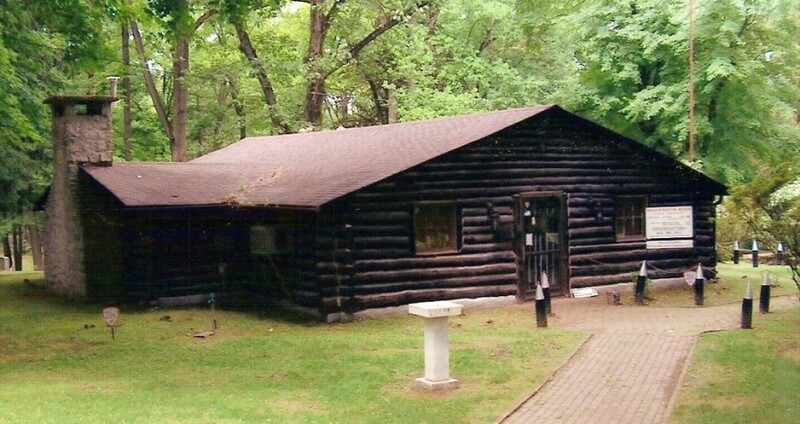 The Memorial service was held at the Washington Memorial Chapel located on the same grounds as the cabin once stood. Our speaker was be Paul Cora! Paul Cora has chaired the Western Front Association East Coast (USA) Branch since 2000 and has been active with WFA since the early 1990s. 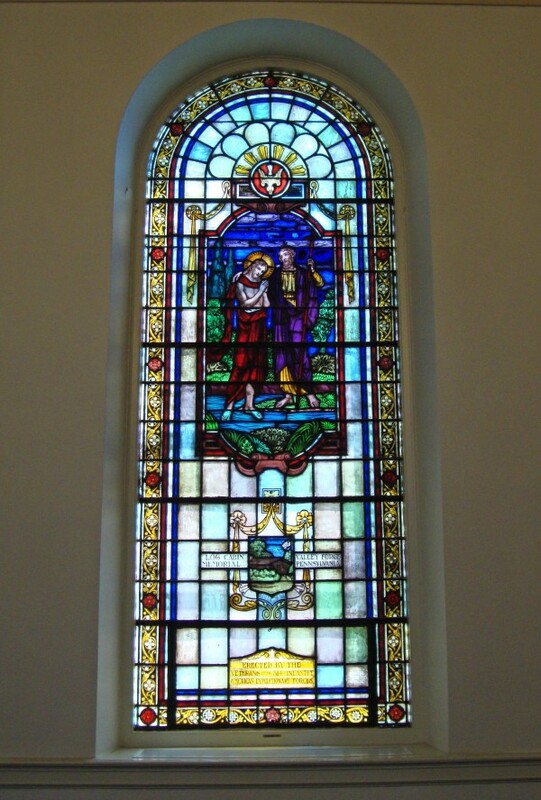 The mission of the WFA, which is an international and membership-based organization, has been to maintain in the public consciousness a memory of the First World War, especially the experiences and sacrifices of those who took part, as an event of critical importance in shaping subsequent history, even reaching our lives today. To this end, the WFA East Coast Branch has sought to provide an outlet for authors and scholars of World War I history to showcase their research, interpretation and scholarship at a wide range of public programs over the past 25 years. WFA East Coast has also sought to support WW1 causes and has sponsored fundraising efforts for WW1 museums, historic sites, memorials and special projects such as the 314th Infantry cabin. Personally, Paul has been an enthusiastic supporter of the 314th Infantry cabin reconstruction project at Fort Meade, and he counts among his highest honors the bestowal of Life Membership in the 314th AEF Descendants and Friends. He stands ready, willing and able to lend a hand with the many other cabin volunteers when the projects resumes in the future. In addition to his WW1 memorial activities through the WFA, Paul is also co-author, with Alexander Falbo, of the book "Supporting Allied Offensives" for the US Army Center of Military History's World War 1 commemorative series. This volume, which chronicles American Army units that fought under British, French and Italian commands in 1918, is due out in July of this year. Outside of WW1 history pursuits, Paul has spent his professional career working in the historic preservation and museum fields with an emphasis on the preservation and display of historic naval ships in Baltimore's Inner Harbor. Thank you -- our 98th Annual Memorial Day Service was a huge success! 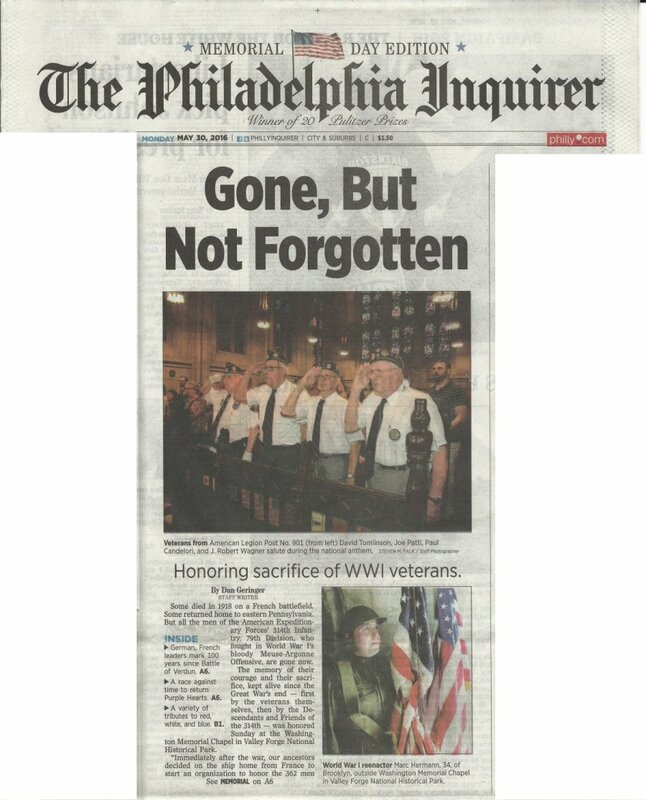 Click to see coverage on TV by CBS3 and NBC10 and Page 1 article in the Philadelphia Inquirer! the story of their fathers, grandfathers, and family members in the First World War. 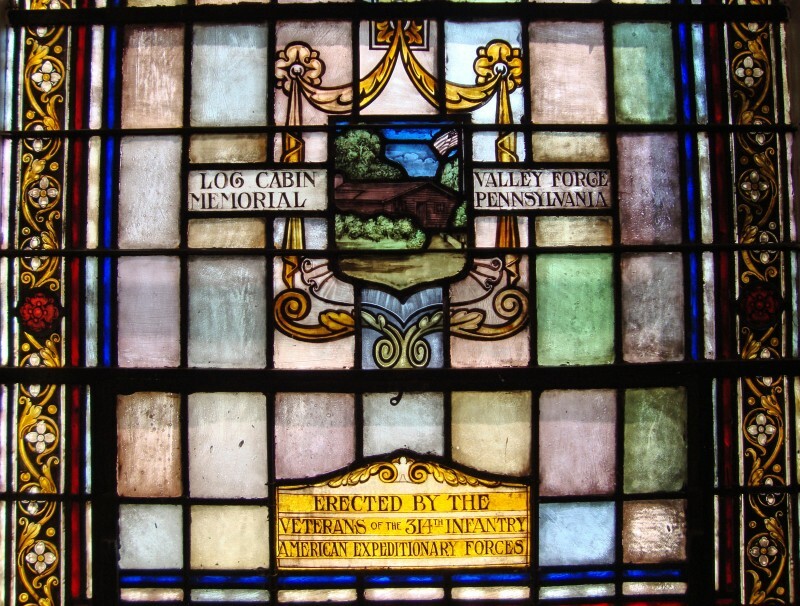 Originally organized as the Veterans of the 314th Infantry A.E.F. the veterans have since passed on. a Memorial Day service at the Washington Memorial Chapel located on the same grounds as the cabin once stood. We are always looking for new members and interested persons. Please title your email inquiries with "314th Infantry". History of the 314th Infantry Regiment A.E.F. Organized as part of the 79th Division A.E.F. the men of the 314th were trained at Camp Meade, Maryland. Arriving at the camp in September, 1917 the unit completed training and sailed to France aboard the USS Leviathan in July, 1918. Upon arrival at Brest, France they continued training until September when they took part in the Meuse Argonne Offensive. Capturing the town of Malancourt on September, 26 1918, they assisted the 313th Infantry the following day in the capture of the town of Montfaucon. It should be noted that Montfaucon was a heavily defended area and observation post of the German army. The 79th Division was relieved on September, 30th and transferred to the Troyon sector. Here they did a variety of tasks, including holding the front. Alternating duty with the 313th, 315th, and 316th Infantry in the trenches. In this period of so called rest, they were harassed with mustard gas, shelling and enemy raids but did not yield the line. At the end of October the 79th Division was again relieved and moved in place to participate in the third phase of the Meuse Argonne Offensive. On November 1, 1918 the 314th drove forward and captured the towns of Crepion, Waville, and Moirey by November, 9th. The following day the unit captured Buisson Chaumont, Hill 328. On November 11th the 314th advanced against Cote de Romagne and stopped firing at 11am., time of the armistice. At wars end that day, the 314th had made the greatest drive of the offensive into German lines, east of the Meuse River. The regiment continued training, passed a review by General Pershing, and shipped home on May 15, 1919 aboard the Princess Matokia. Arriving at Hoboken, New Jersey on May 26, they were discharged at Camp Dix, New Jersey end of May 1919. This is a brief overview of the regiment and its actions. For more information about the 314th in World War One there is a current two volume booklet for sale. Please contact Steve Rentz at srentz@comcast.net Also see list of books and websites on this website. August 25, 1917 General Joseph H. Kuhn assigned to Camp Meade to organize and command the new 79th Division. Sept. 19, 1917 First contingent of selected men arrived at Camp Meade. April 6, 1918 Division paraded in Baltimore before President Wilson. July 8, 1918 Sailed for France on the U.S.S. Leviathan. July 15, 1918 Arrived in Brest, France. July 25 - Sept. 8, 1918 Regimental training begun in the vicinity of Prauthoy, France. Sept. 26, 1918 Commenced Meuse Argonne Offensive: Captured Malancourt, France. Sept. 27, 1918 Montfaucon captured by the 313th Regiment, assisted by 314th Regiment on the right. Sept. 28. 1918 Nantillois captured by 315th Regiment. Sept. 30, 1918 Relieved by 3rd Division and moved to Troyon Sector. Oct. 26-28, 1918 Relieved from Troyon Sector by 33rd Division. Nov. 1, 1918 Participated in third phase of Meuse Argonne Offensive. Assigned to Belleu Bois and Bois de Chenes. Nov. 6, 1918 The Borne du Cornouillier (Hill 378) captured by the 316th Regiment. Nov. 9, 1918 Captured Crepion, Wavrille, Gibercy, and Moirey. Nov. 10, 1918 Captured Hill 328. Nov. 11, 1918 Moved against Cote de Romagne. Armistice ended operations. April 12, 1919 Division reviewed by General Pershing at Orquevaux. May 15, 1919 Sailed home on the U.S.S. Princess Matoika from St. Nazaire, France. May 26, 1919 Arrived at Hoboken, New Jersey. May 27-31, 1919 Discharged at Camp Dix, New Jersey. 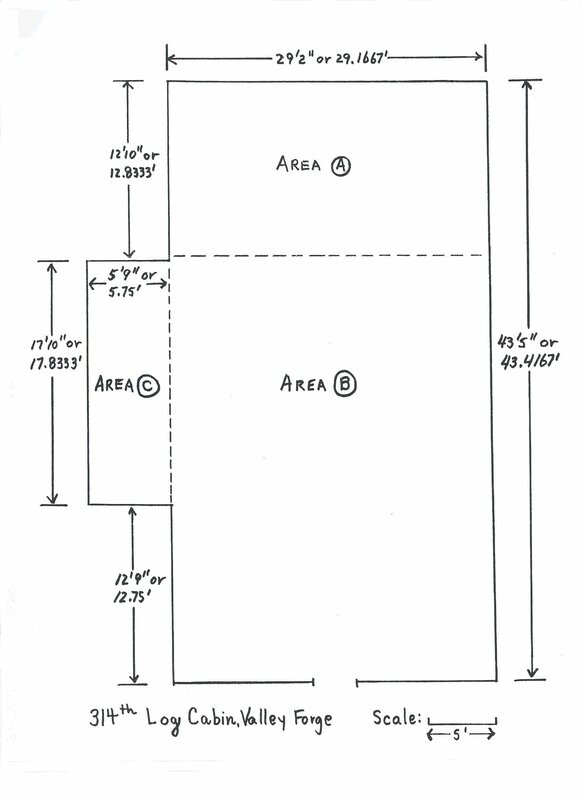 If you are looking for more detailed 314th timeline and information, click here to view the Historical Documents. Commanded by General Joseph H. Kuhn, the 79th Division was organized in August 1917. Composed of Pennsylvania, Maryland, and District of Columbia men, later rotations of draftees would include New York, Ohio, Rhode Island, and West Virginia. The division trained at Camp Meade, Maryland which included help from British and French officers. Trench warfare was studied and taught but the American Army had taken the open attack approach for the upcoming offensives and the training reflected this. Several times during the course of training, men were moved from the division to other units. This, along with lack of proper equipment, and sufficient training hampered the division from deployment to France. The 79th shipped out to France in July 1918 and continued training upon arrival in France. At the beginning of September 1918 the division entered the front line, relieving units of the French Army, and participated in the first phase of the Meuse-Argonne offensive. The average training of the men at this point in time was approximately 33 days, due to replacement troops. During the course of the next two months the 79th would earn two distinctions. One, for holding up the advance against formidable odds at Montfaucon, France and two, for making the deepest thrust into German lines on the last day of the war, November 11, 1918. Communication problems, terrain, snipers, little artillery support, and overrun enemy positions in the rear were all problems for the division. French and Allied Aero support were all but nonexistent in several cases. Division strength in August 1918 was at 26,150 men. In November the total is at 19,035. Although the division was only engaged from September 26, 1918 to November 11, 1918, it lost more men than any other American division during this period. In the battle of Nancy during the 15th Century, Charles the Bold, Duke of Burgundy, was defeated and the reign of the House of Anjou began. The Lorraine Cross was adopted by the new reign (Rene 11, 1473-1508) and served as a symbol of justice and freedom to the people of Lorraine and French Nation. During all its war service, the 79th Division fought in the French province of Lorraine. Fighting against formidable odds, the division claimed victory. It is only fitting the division would choose the Lorraine Cross as its symbol and was adopted shortly after the war ended. Originally called the Liberty Division, the 79th pledged to win back that portion called Lorraine for France. It is with honor that the 79th Division still wears the Cross of Lorraine today. The Lorraine Cross was adopted by Major General Joseph Kuhn and his staff shortly after the armistice was signed. Approved by General Headquarters, the insignia was to be worn on the upper left arm near the shoulder. Many variations of the patch exist maybe due to the fact that most or all were sewn in France by different manufacturers. Since the insignia was adopted after the end of the war it is quite possible that many of the men had little time to sew it on their uniform before boarding ship for home. UNITS COMPRISING THE SEVENTY-NINTH DIVISION A.E.F. Click here to read the most recent Bugle Call Newsletter, for the latest news about the cabin and collection. 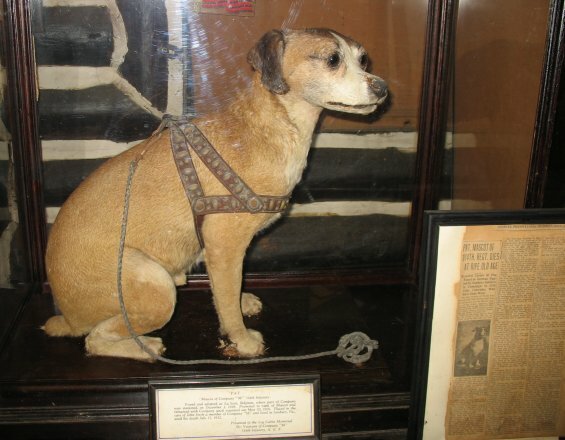 Pat the Dog was mascot and friend to the soldiers of the 314th Infantry. there has been an enduring bond between soldiers and their dogs over the centuries. And that bond has been strong whether the soldier was an infantryman or a General. The article has many photos which show that very strong bond. at http://www.ww1-centennial.org is a collaborative association of organizations, museums and historic sites in the United States related to the First World War. The goal of the Network is to further public awareness of the history and memory of The Great War (1914-1918) as we approach and experience its centenary years. To this end, the World War I Centennial Network fosters collaboration and cross-promotion of the special events, commemorations and exhibits created by its members. "Website project will honor WWI veterans"
Joel Rentz- grandson of Irwin Rentz, Company A 314th Inf. Judge Joseph T. Labrum - son of Joseph Labrum , Company G 314th Inf. "The troops were tired when they they went into the fight. having been under our bombardment for several hours. For green troops it was quite an ordeal." From John Eisenhower's book YANKS chapter 17 starts with the quotation above. The Western Front Association is an international organization dedicated to the study and memorialization of those who fought in the First World War. There are multiple chapters throughout the world. The USA - East Coast Chapter holds two WWI historical seminars per year, one at the Maryland War Memorial Building in Baltimore (where we sponsored the creation of a 313th Infantry exhibit), and the other at various locations in the Washington DC - Baltimore-Philadelphia corridor. 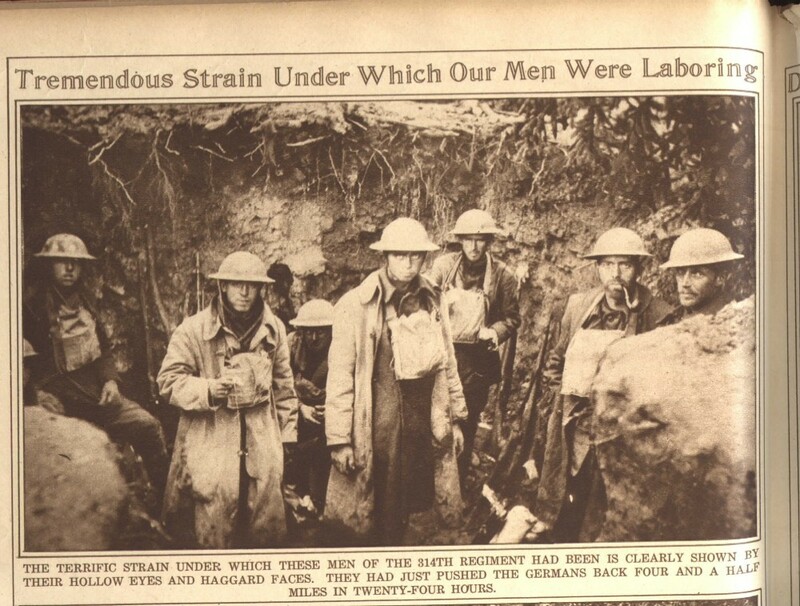 The East Coast (USA) Chapter of the Western Front Association is led byPaul Cora, Chairman, and they have just published their Summer 2011 newletter, "Trench Lines", a copy of which is mirrored here. Facebook: The 79th Division in WW1 @79thDivWW1 by Jim Abels: I started a project last year where I set out to cover as close to a day-by-day story of the men of the 79th Division, A.E.F during their service in World War 1. Posts have been coming out almost daily, with things getting ready to pick up a bit next month. If you are interested in the 79th Division, or just enjoy reading primary source material from the period, please give my page a "like" to follow along. If you have any questions or feedback, send me a message through the page. I try to answer each message the day it is received. The 314th Infantry Regiment 79th Division Vol. I and Vol. II. A current booklet history compiled by Roy Rentz. Available by contacting Steve Rentz at srentz@comcast.net. Cost is approx. $35.00 for both volumes. Maps, photos, etc., benefits 314th Inf. History Of The 79th Division, A.E.F. published by Steinman and Steinman, Lancaster, PA.
American Armies And Battlefields In Europe by Center of Military History-United States Army - maps and photos. One Of The Last Rugged Individualists by John W. Kress- The Great Adventure of the 314th M.G. Co.
Memoirs Of Walter R. Balthaser 1918-1919- member of Co. H, 314th., hard to get, written in 1974.
www.worldwar1.com An excellent website with lots of related links, newsletter and world wide information on the Great War. www.washingtonmemorialchapel.org Visit this site for information about the chapel and the 314th at Valley Forge, PA.
www.abebooks.com and www.alibris.com are good sites for book searches. In France and Belgium the Great War of 1914-18 was fought along a 500-mile front. In most places the trenches that formed the front have disappeared but in some parts of France they still exist. Expert battlefield historians and guides Tony Noyes and Christina Holstein lead definitive guided tours and walks of the largely untouched First World War battlefields of Verdun, the Argonne Forest, the Meuse-Argonne, the St. Mihiel Salient and Champagne. That means you can walk the terrain, understand the campaign, and put yourself in the soldiers. boots. Whether you are looking for an introduction to these battles, an in-depth exploration of a particular area or action, or wish to follow in the footsteps of a member of your family, our individualised guided tours of the battles will meet your requirements. The Fort George G. Meade Museum was established to collect, preserve, study and exhibit historical artifacts pertaining to the history of Fort George G. Meade. The Museum is dedicated "in proud memory of those members of the United States Army who died in the defense of Freedom". TrenchArt.Org by Jane A. Kimball: Cruel destroyers of humans and landscapes Transformed into objects of beauty, Providing a remembrance of comrades lost And souvenirs for those who lived to tell their tales. BACKGROUND: Soldiers have always made decorative or souvenir objects in their spare time. More than 18 GigaBytes of information about 314th Infantry Regiment and 79th Division, A.E.F. and World War One !